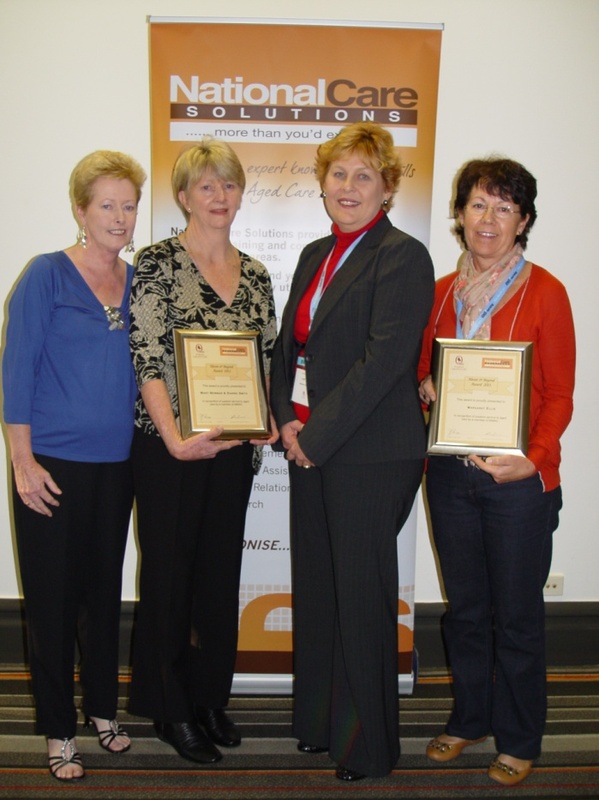 2011 "Above and Beyond Award Winners" Mary Newman, Dianne Smith, Lyn Turner, National Care Solutions, Margaret Ellis. Absent Jeanelle Everitt. The Awards are bestowed by National Care Solutions and NIMAC through an agreement between both parties. They recognise exceptional contribution by an individual or organisation who has significantly changed and improved the quality of services to older Australians through their actions, commitment and dedication to aged care. The recipient will have made a notable contribution at a local, national and/or state level over a number of years. Nominations are made via colleagues or peers. The recipient of the awards are determined by a panel made up of one business representative, a representative of National Care Solutions and a representative of NIMAC. We had a very high calibre of entries this year and would love to say the same next year. To all NIMAC Members we encourage you to start thinking about who you might like to nominate. The winners of each of the 2 prizes each receive a prize of $500 for them to use as they wish. 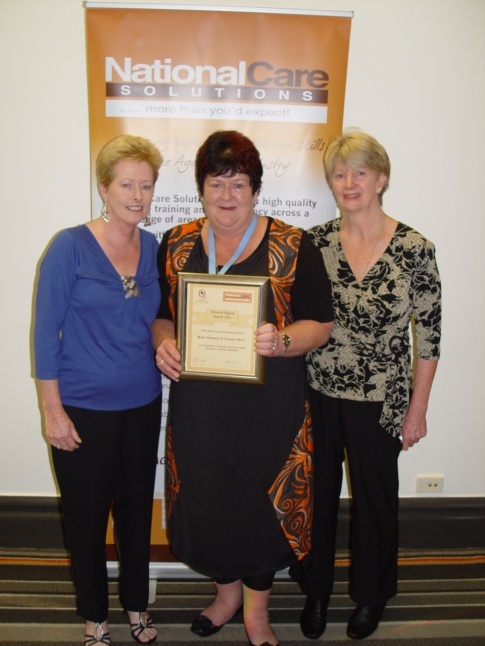 Mary Newman and Dianne Smith with the manager Maxine Noone from Northridge Salem, Toowoomba. Mary Newman (AIN) and Dianne Smith (volunteer) took it upon themselves to create a living garden in the dementia area. This was down in their own time and quickly became a project involving many more ‘volunteers both from the site and the community. Fragrant plantings such as lavender and rosemary line pathways to allow walkers to brush them as they traverse the oaths. Standard roses add their perfume and tall hardy camellias have softened hard corners of the building. This area has now become the residents “front yard.” The back yard had citrus trees and some vegetables planted. The residents are excited at being able to pick their own tomatoes, peas, beans and strawberries. The garden is so good it was entered into the Toowoomba Carnival of Flowers Competition and received 3rd place in the Hospital, Nursing Homes and Retirement Villages section. The garden has brought great pleasure to the residents as they wander along the paths and enjoy lunches in their colourful garden. Margaret was nominated by David McDonald the general manager at Villa Serena and her peers. Throughout all the pressure a CNC experiences Margaret remains steadfastly client focused Villa Serena has undergone extensive refurbishments and also a change or ownership in the past 2 years and throughout that time Margaret has consistently reinforced residents care priorities in relation to resident moves and communication. 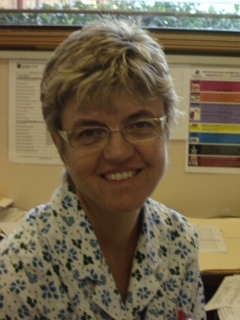 A strong focus Margaret hold is the support of the clinical team around her. Margaret recognises that a happy and confident team provides better residents care. Margaret strongly advocates for staff education and is an active participant as she leads by example by continuously pursuing her own professional goals and aspirations. 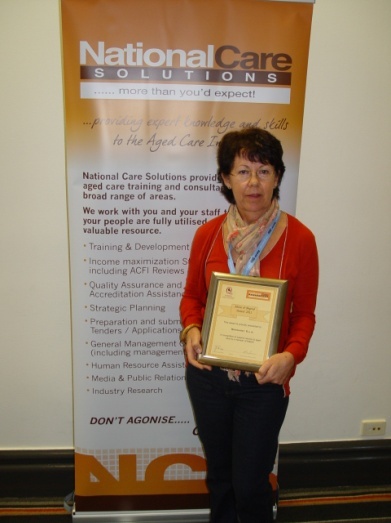 Jeanelle Everitt from Waroona Multipurpose Centre, Charleville. The residents have always been Jeanelle’s main focus, and she has tirelessly worked to improve their care through changes in staff practice, improvements in access to services and quality improvement strategies.